Business Communications Manager 50 is an all-in-one, affordable platform for converged voice and data communications for small to medium business with 3 to 20 users, yet scalable to serve more than 40. Business Communications Manager 50 provides advanced capabilities such as robust telephony features, voice messaging and unified messaging, IP networking, Internet access, contact centers with skills-based routing, and IP telephony. With an easy-to-use and highly flexible architecture, the Business Communications Manager 50 enables small sites to benefit from convergence capabilities that were previously only available to much larger organizations. One of the industry’s largest portfolio of telephony features: More than 200+ in all — lets you process calls with exceptional reliability, efficiency and flexibility. You can be sure that all callers receive prompt, professional treatment. Employees enjoy convenience, productivity and control features that reduce phone tag and frustration. For example, the system can put a call on hold to page a person, who can then pick up the call from any extension. Automated Attendant: Answers calls 24 hours a day with your personalized greetings and routes calls to the right people, departments or voice mailboxes — according to time of day, day of week, holiday schedule and calling line ID. The routing logic can include multiple levels, so callers can self-direct to exactly the right destination. Unified Messaging: Converges voice, fax and email messages onto users’ PCs or laptops, to be managed by one standard application, such as Microsoft Outlook or Exchange. This convenience can be a real time-saver, especially for users with heavy call volume. Universal Internet Access: Gives authorized users access to the company intranet or the Internet. Optional security features — such as authentication, encryption, firewall and virtual private networks (VPNs) — provide safe connectivity among business sites and for mobile or home-based employees. Computer Telephony Integration (CTI): Enables you to use third-party, PC-based applications to control telephone services, such as a click-to-call company directory or automatic screen “pops” of a customer’s account status alongside a customer’s call. It’s simple to activate, set up and manage these applications from any workstation that has LAN or Web access, using a standard management application called Element Manager and “Start up Profile”. With the launch of the BCM 50, smaller branch offices can now enjoy the same advanced business functionality as larger sites. Part of Nortel’s range of convenient, cost-effective convergence solutions, the BCM 50 is perfect for companies with smaller sites or branch offices. Catering for locations with as few as 3 desktops – and as many as 44 Digital users , or 32 IP users (or a combination of the two) – it provides access to high value business applications such as Nortel’s Messaging, Unified Messaging and Call Centre. These applications all come pre-loaded, so that businesses can activate them as needed using Keycodes, and thus reduce the cost of implementation and deployment. 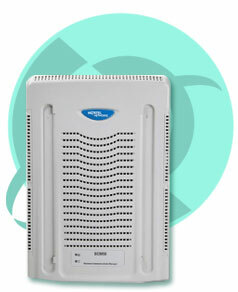 For added flexibility, the BCM 50 Main Unit is also available in three versions, ranging from the basic BCM 50 without router to the BCM 50e, with Ethernet router, and the BCM 50a, which includes an ADSL router. Designed to meet a variety of branch office requirements, the BCM 50 can also be deployed as a pure IP solution, a converged (hybrid TDM/IP) solution or a traditional digital solution, depending on your needs. Nortel BCM 50 Platform Affordable converged voice and data, all in one package, Perfect for businesses with 3 to 20 users, yet scalable to serve more than 40, Simple to use, install, and maintain, Robust portfolio of telephony features pre-loaded—more than 200+ in all, Simultaneously supports a choice of digital and IP telephone sets. Nortel BCM Business Communications Manager 50 with Ethernet Router Affordable converged voice and data, all in one package, Perfect for businesses with 3 to 20 users, yet scalable to serve more than 40, Simple to use, install, and maintain, Robust portfolio of telephony features pre-loaded—more than 200+ in all ,Simultaneously supports a choice of digital and IP telephone sets, Integrated Ethernet Router. Nortel Rackmount Shelf for Mounting up to 4 BCM50 Main Unit Adds an additional capacity to the Nortel BCM 50 by utilizing a single Media Bay Module. Up to two external BCM 50 Expansion units can be used to expand the capabilities of the Nortel BCM 50 main unit. A simple RJ-45 CAT5 cable connects the expansion unit to the BCM 50 and the expansion unit uses its own external power supply, which is included. Nortel BCM Business Communications Manager 50 Expansion Unit Install the BCM 50 Small System Rackmount Shelf in a standard 19 inch rack, and mount the BCM50 and expansion unit on it. The details on the shelf firmly lock the BCM50 in place. The bracket also provides space to store power supplies for the BCM50. An optional patch panel is available to provide RJ-45 connections for the main unit trunk and station interfaces. Nortel BCM50 Main Unit or Expansion Chassis Wallmount Bracket You can use the wallmount bracket to mount the BCM50 and expansion unit to a vertical surface. Attach the bracket to the surface, and hang the BCM50 from the bracket. The details on the bracket ensure that the BCM50 securely locks into place. The lower part of the bracket includes a covered cable tray, allowing for organized and visually neat management of cables. An optional add-in card (NTAT0100) is available that mounts into the cable tray; providing RJ-45 connections for the main unit trunk and station interfaces. Nortel DESI PAPER 36250 Desi paper overlay for Nortel T7208/T7100 and T7316/7316E. Package of 25 Sheets. Nortel T 7208 Desi Plastic Overlay Lens Plastic overlay Lens for Nortel T7208. Nortel BCM Analog Terminal Adapter The Analog Terminal Adapter-2 (ATA-2) converts BCM digital interfaces to analog for communication with such analog devices as single line telephones, fax machines, modems and answering machines. Business Series Terminal II-T7406 An additional cordless handset that will function with a currently existing base and cordless handset. Business Series Terminal Door Phone Enables office personnel to talk directly with visitors prior to their entering a business.It allows two-way conversation between the Norstar phone and the Doorphone. Nortel i2004 Internet Telephone with Power Supply A professional-level desktop Phone which supports up to twelve user-defined line/programmable feature keys and comes standard with a large monochrome display. Nortel i2002 Internet Telephone A multi-line, intermediate-level, standards-based Phone with programmable line/feature keys and hands-free speakerphone. Nortel i2007 Desktop IP Phone Virtual Network Computing technology desktop IP Phone. Nortel IP Phone 1110 a single-line, standard-level desktop Phone, which encompasses a sleek, cutting-edge ergonomic design. Nortel IP Phone 1120E a multi-line (four lines), intermediate-level desktop phone encompassing a sleek, cutting-edge ergonomic design with USB peripheral support. Nortel IP Phone 1140E a multi-line professional-level desktop phone encompassing a sleek, cutting-edge ergonomic design; with a USB peripheral support,Audio gateway for mobility at the desktop, and Gigabit Ethernet ports for LAN and PC's. Nortel IP Audio Conference Phone 2033 A full duplex, handsfree conference phone for the desktop. Nortel IP Audio Conference Phone 2033 with Extension Microphones A full duplex, handsfree conference phone for the desktop, with two extension microphones.